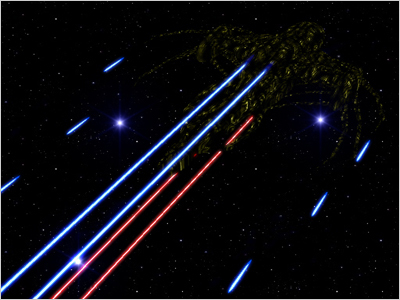 Upon launch, the torpedoes phase into an intangible state allowing them to pass through energy shields. Each torpedo uses a different frequency making it extremely difficult to develop an energy shield against them. After passing through any energy shields, or alternatively - upon reaching a certain distance from its target, the torpedo phases back to normal and, upon impact, detonates a polyphasic wave, which destabilizes the molecular structure of its target by phasing out certain key parts of the molecular sequence in the detonation radius. This causes a catastrophic breakdown of the target's structure and creates an explosion at the molecular level. These cannons pulse-fire supercharged forms of destructive tachyon particles. These particles can pass through most forms of energy shields, however, depending on the shield type, the destructive force of the particles is reduced as they pass through. 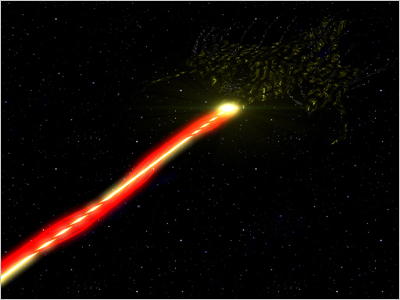 A beam of energy similar to a Federation phaser, however with a substantially more powerful output. 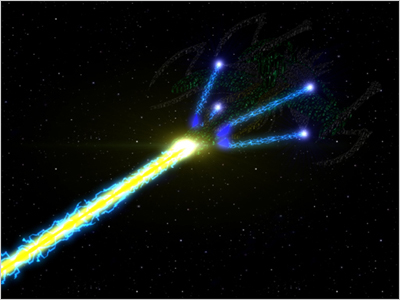 The Kep gun is a pulsar beam of highly compressed anti-photons. Currently only known to be equipped on Node vessels, this is an extremely powerful weapon with a highly destructive output, and is currently one of the most powerful ship to ship weapons known to Federation science. This weapon fires a pulsating beam for a duration of up to six seconds, and is capable of destroying almost any other vessel. 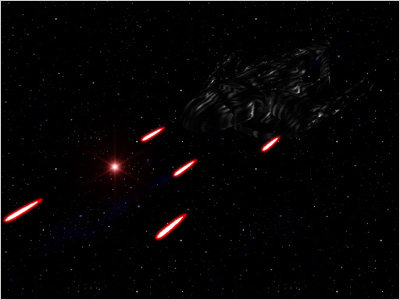 Its only drawbacks are a 10 minute charge time (at maximum power), and a relatively slow tracking speed, thus a fast maneuvering ship would be able to move out of the beam. Its power is obtained directly from the slipstream core, so a slipstreaming Node or one with its slipstream core damaged or off-line cannot charge the weapon. This weapon is actually two weapons in one. 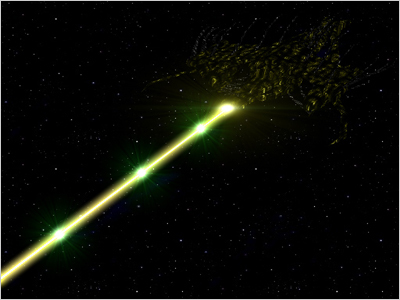 The first is a straight yellowish beam that targets the atmosphere of a planet. It causes a chain reaction which completely removes all the neucleogenics from the atmosphere, making the planet incapable of producing water. The second is a group of red spiral beams which encircle the first beam, and target the surface. Upon impact, the weapon creates a cataclysmic wave, similar in appearance to the genesis wave, which engulfs the planet surface, vaporizing water and all organic material, such as plants and animals. After a period of one year, the world is no longer capable of supporting life for extended periods of time without habitat domes. This is a prototype weapon, which was installed in place of the forward Kep'Tak'nel on a refitted Node vessel. After succesful tests of the prototype Kuljanul that was fitted on the node, the sernaix developped this weapon for use. The new enhanced version, equipped on all Dreadnought class ships is more efficient and more destructive than the original.